‡ The petrol depots were being burnt to prevent the Germans using them. On the 11th June  suddenly a great yellow sulphurous smoke floated in from the north over Paris. What it was I’ve never known; whether it was just smoke bombs‡. Anyhow, it was very sinister in it’s effect; it was like a plague coming in. Léontine said she must go and see if her family were all right. Suddenly she had her own family. Everyone had a story. What to take? The Balthus were having trouble getting their carpets on the car! Who to take? A friend of the Jouves phoned up and asked if Pierre had a seat in the car. I heard Pierre saying to Blanche: Ah, Druot, he said, he’s wanting a seat, could we fit him in? Blanche said, No, no, we couldn’t possibly. And Pierre said, well, what about Desmond, he’s not really very close? Blanche said, Isabelle wouldn’t drive us if Desmond doesn’t come. We left on the 12th,at 5 in the morning in two cars: Fifi’s Peugeot, which Desmond drove with Fifi, the cook and a couple of French poets, and the Jouves’ Citroen, which I drove, with Pierre in the front and Blanche and Maud in the back. Maud had been rather ill, she had kidney trouble, and both of them were about 60 years old. There was little room for luggage. The roads were absolutely jammed with cars. We moved a few inches at a time, and you thought it would thin out as you got along but it went like that for miles. We left at 5 and by midday we were five miles outside Paris. We could see all these Belgian refugees on the road, blocking half of it with their ox-drawn carts. They looked like 19th century paintings of peasants, plodding along stoically. The cart would have a calf in it, and chickens, and their children. One heard the Germans had driven them on the roads to block them and it was very effective. With the people streaming out from Paris as well, it was quite impossible for any French reinforcements to come up. The roads were solidly blocked for about a hundred miles round Paris. The German planes would come over and fire shots at us, just for the fun of it, to make people skuttle. God, they made one furious! You were more angry than frightened, were you? Much more angry than frightened, yes, it was so unsporting. One felt if only one ever gets you! Luckily Pierre had been invited to stay by an écrivain, a writer called Bonnefoy who ran a newspaper in Clermont Ferrand. He’d offered him asile in his 11th century chateau. Pierre didn’t stop to think that this was Laval country, and Laval was a collaborator. When I came back after the war and saw Pierre he said: Ah, Isabelle, il est condamné à mort en contumace, Monsieur Bonnefoy ‡. But at the time we needed a place to go. They kept stopping us and looking at our papers. There was one light moment when a young soldier who looked at Pierre’s papers handed them back and said: vous écrivez de très belles poèmes, monsieur. Ah!, Pierre said, and he wanted to get out and have a chat with him! Pierre studied the map and said they were wrong in directing us onto the main roads like the one to Bordeaux which was being heavily bombed by the Germans. We took side roads and zigzagged our way down off the mainstream. That was much better, but we couldn’t manage to get any place to put us up so we stopped for the night just on the road. Maud and Blanche were suffering a bit with their kidneys and their whatnots. I was sitting pretty because I was in this very comfortable upholstered luxury motorcar and Pierre was absolutely marvellous. He said: Ah, tu te rappelles, Blanche, and he started talking about their early days, he and Maud and Blanche, and incidents that had happened, and he got them both laughing and absolutely lifted their spirits. Suddenly he said, Oh, Isabelle, you better get out the car, c’est Desmond qui approche. He’d been sleeping in the little car with the two French poets, Fifi and the cook, and he was outraged. Also, he hadn’t had a drink! At last we get to this eleventh century chateau. Monsieur Bonnefoy also painted pictures. The room that was to be Pierre’s study had a huge table in it around which were hung all these paintings. This got Pierre’s ire up - all the pictures had to be turned to the wall. Soon Pierre wanted to move, he decided it was insupportable there, he wanted to go. We had to get petrol, but when the Germans came the reserves of petrol had been emptied so the Germans wouldn’t get them. Finally we got some and we drove off. The retreating French army were lying about: trucks were blocking the road: everything a débacle. The French had put up a big poster of a soldier saying: Nous gagnerons parce que nous sommes les plus forts. Seeing it a soldier spat at it saying, Nous sommes les plus forts! They were exhausted, retreating in front of the Germans. We decided we just had enough petrol to drive back instead of going on into God knows what. But Pierre had forgotten to turn the pictures round when he left, so Madame Bonnefoy, who had been all over him on arrival, was quite a different character when she let us into the house again; the insult to her husband, her husband’s art. Pierre did a disappearing act. In the courtyard there was a well, and Maud Burt and I were both walking up and peering into it to see, was he in it? Il est tellement déprimé, Qu’est-ce qu’il a fait ? Est-ce qu’il s’est suicidé ? Poor Madame Bonnefoy became so agitated that when he discreetly allowed her to discover him at the right moment she gave him a great coup de ventre and let us back in under her roof again . When Pierre heard the famous Appel du 18 Juin, he gave Isabel a telegram of support to send to De Gaulle from the village. The next day the French government announced that anyone supporting De Gaulle’s Free French movement would be denounced as a traitor. Pierre, understandably alarmed, asked: Est-ce que tu a envoyé ce télégramme, Isabelle? Soon the war was declared over. We were occupied by the Germans, but after the treaty they went back. However I told Blanche that Desmond had to go because he was of military age and England was still at war. I wasn’t - I was a South African, but I was feeling rather guilty by then because he was trailing along with me and not thinking about his own situation. We had to go to the authorities for permission. It was a near thing! We got a puncture not far from the place. Never had we worked so quickly and in such complete understanding. We got everything out and changed the tyre. We just got there as they were closing - for good - and they gave us the pass. Fifi kindly gave us the car, her Peugeot. We drove through France, through the Cevennes, where Stevenson went with his donkey. Desmond knew the book well and we made literary chat till we got another puncture. That was a bit grim because France was having a day of mourning - all the houses were shuttered and nothing moved but us in Fifi’s Peugeot. At last we saw a garage, a place with a pump. We tried knocking but nothing happened. We were just giving up when a man came out and assisted us. It turned out that he was an English soldier who’d been there since the First World War; he’d deserted and married a French woman. When he’d seen the English number plates, he’d realized we must be escaping back to England and came to our rescue. Wasn’t that nice of him? 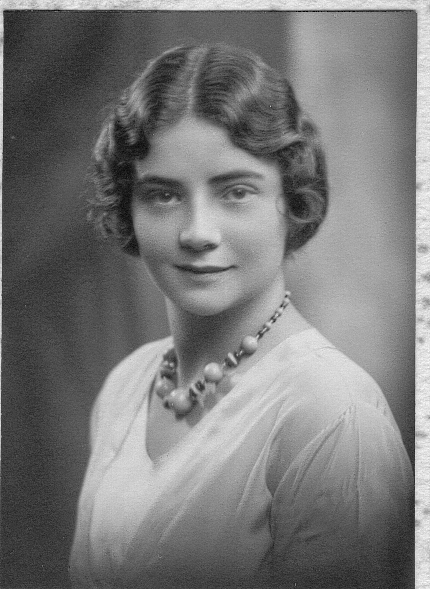 Isabel Ryan (nee Neilson, 1914), born in Durban, South Africa to parents of Scots Presbyterian origins. Alec Neilson was a chemist who managed a fertilizer company and her grandfather had been a senator in the S A parliament. 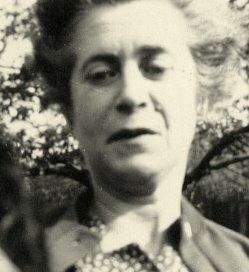 Age 21, after obtaining a Degree in Biology, she left her sheltered family life in Durban to be treated by Blanche in Paris for nervous problems. 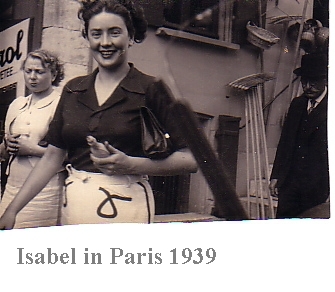 With Blanche and Pierre in loco parentis, Isabel thrived on the freedom, the fashion and the social and cultural stimulus of Paris in the thirties. Leontine was a cook/cleaner recommended by Blanche to Isabel who had a flat in the Place St Sulpice. Desmond Ryan, 1910 - 1976, grandson of Hugh Ryan, an Irish emigrant to Canada in the 1840s who made a fortune as a pioneering railway contractor and became a great benefactor to the Catholic community in Toronto. The last of four children, Desmond was born in London and was the first of his family to show a literary bent. After a short spell as an aesthete at Oxford studying classics, he took a year abroad in the USA, married a New Mexican, had a son, Sebastian, in 1932, bought the Centaur printing press in London in 1934 and when this failed, a friend took him to consult Blanche to help him overcome the nervous collapse brought on by his debts and drink problem and make himself a career as a literary journalist. Blanche encouraged his liaison with Isabel, possibly seeing an echo of herself and Pierre in this ‘grand amour’ between a pretty young woman who had wanted a medical career and a struggling married writer. The Schusters were a London banking family, originally German Jewish. The family were also very musical and it was this that attracted Fifi’s mother Lady Lucy, who was from an aristocratic Scots family related to the British Royals, to marry Sir Victor. Fifi was a patient of Blanche. Maud Burt. Isabel describes her as follows: “Of course it was rare for a woman to be head of the Institut Britannique. She had a very uphill battle to get equal treatment, to be taken seriously. She was a pretty looking woman, Maud Burt, an English rose with pink cheeks and blue eyes, very feminine. She had lodged with Blanche. Blanche’s parents were dead and she lived on the Left Bank with her grandmother who took in boarders. That’s how they got to know each other. Blanche was just being the jeune fille as girls were expected to be and she was fired by Maud to make a career for herself. Maud helped in the battle to get the grandmother to allow her to go to medical school. They were women who’d had to fight to get a position." René Bonnefoy, born 1895 in Lempdes-sur-Alagnon (43) in the Auvergne. He was a writer, painter and journalist for a newspaper owned by Laval who gave him a post as Secretary-General for Information in the Vichy government in 1942. After the war he disappeared and was condemned to death in his absence. In 1955, by which time his early novels were becoming well-regarded, he gave himself up and had his sentence reduced to ‘5 ans d’indignite nationale’. 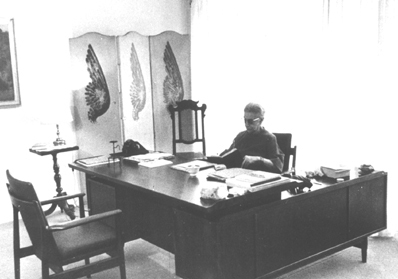 Since 1946 he had become well-known as a science fiction writer for the Fleuve Noir series under the name B.R. Bruss. He also wrote other novels using aliases such as Roger Blondel. Charles Moreau, a SF enthusiast, uncovered the double identity as described in his blog. There is also a Wiki entry under B.R. Bruss.